While BORP does not offer adaptive baseball, we are happy to get the word out about opportunities offered by community partners and other local agencies. Our friends at North & South Oakland Little League (NOLL/SOLL) have announced that registration is open for the 2014 Challenger Division*. Challenger baseball is FREE to play for eligible kids and there is no charge to register. Games are played on Sunday afternoons from mid-March through mid-June. Families who live in the cities of Oakland, Piedmont, Emeryville or Berkeley (South of Virginia Street) are eligible to play in NOLL/SOLL. You can search for information on Challenger Divisions in other locations here. For more information on NOLL/SOLL Challenger Division baseball, contact Jim Balich at: (510) 465-3998 or jrbalich@earthlink.net . 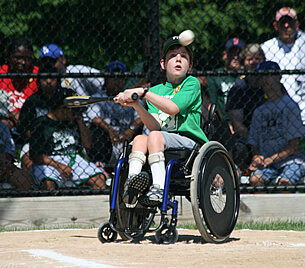 *Challenger Division was established by Little League in 1989 as a separate division to enable boys and girls with physical and mental challenges, ages 7-18, to enjoy the game of baseball along with the millions of other children who participate in this sport worldwide. 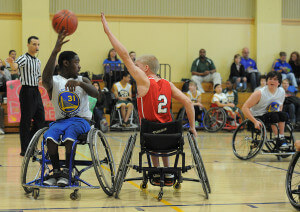 Today, more than 30,000 children participate in more than 900 Challenger Divisions worldwide. What an amazing weekend of youth basketball in Berkeley. 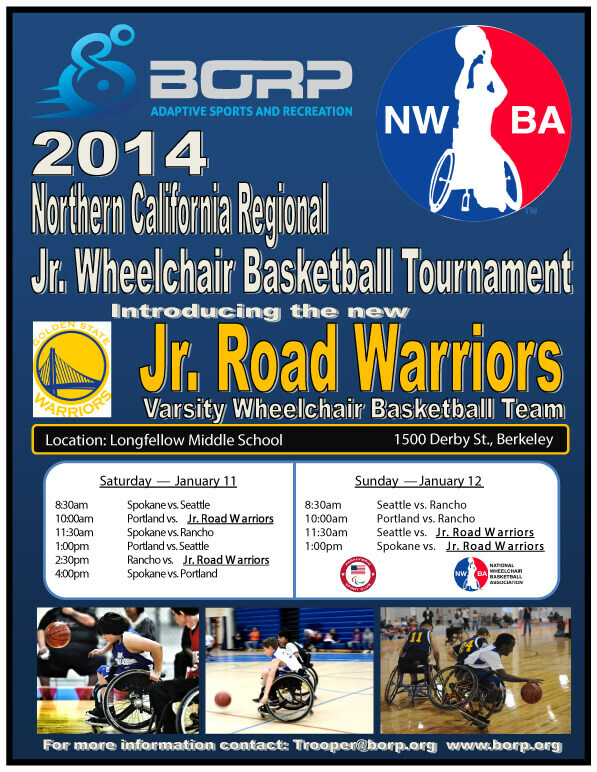 The 2014 NWBA Northern California Regional Junior Wheelchair Basketball Tournament was played this past weekend and it was incredible! The event kicked off on Friday evening with a dinner/dance party for the teams competing in the tournament. Saturday’s games began with a bang and it was obvious that the teams coming to town had prepared for this weekend. This was the first time BORP would be playing as the Jr. Road Warriors thanks to a brand new partnership with the Golden State Warriors. The gym at Longfellow Middle School was packed with the loudest crowd ever seen or heard at a BORP Youth game, and when the Jr. Road Warriors scored their first bucket the place went nuts. Unfortunately, BORP’s offense stalled and the team fell 36-20. Next up was a game against the Rancho Renegades, from Los Angeles. BORP had beaten Rancho during a tournament in Phoenix last month, and both squads anticipated another close game. The Renegades came out determined to avenge their loss and seemingly could not miss while BORP simply could not get on track. It was one of those games best forgotten for the Jr. Road Warriors. Fortunately for the BORP kids, the weekend was not over and the team had time to regroup for Sunday. 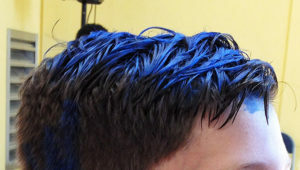 Donning their new white and blue Jr. Road Warrior jerseys, the kids showed up on Sunday with an amazing attitude, and in a show of team unity, had sprayed their hair with blue highlights. It seemed to work. So well in fact, coach Trooper Johnson is now considering buying a case of blue hair spray for the rest of the season. The first game on Sunday for the home squad was against Seattle and was one of the best of the tournament. Seeking to redeem themselves from their poor showing the day before, the Jr. Road Warriors pressed Seattle and forced turnovers from the start. BORP took a lead and held it for most of the first half. They dictated the pace of the game and worked together with an incredible team effort. Cortney and Christie were able to pick and seal for their teammates and play incredible defense. Koda was forcing the action all over the court and led the team with 24 points. William played fantastic defense and added 5 assists, and Andre added 10 points and 4 assists in the effort. Down by 3 with just over a minute to play, Jr. Road Warrior Amit Vigoda was fouled and went to the line. In his earlier free-throw attempts, 11-year old Amit had failed to reach the basket, but when his team needed it most he was able to drain the first of two shots to bring the deficit down to two points. BORP’s defense got a stop and was able to get possession of the ball still down by two with 14 seconds left. The crowd was going crazy as Coach Johnson’s play design worked beautifully on the inbound. Unfortunately the final shot would not drop and the game ended with Seattle on top 40-38. Even though the team lost, it was a game to be proud of. The effort and intensity that they showed was exactly what the coaches want to see from them, and they finally showed the crowd what they were capable of. BORP finished the weekend with a matchup against Spokane. Most of the kids on the two teams have known each other for years and this has become a playground-type rivalry. Coach Johnson switched things up a bit and started Matthew and Daniel. The teams battled back and forth throughout the game, but the Jr. Road Warriors were able to continue to build a lead throughout the first half. During the second half, Spokane put on a run and cut the lead down to six points. BORP stretched it back to 10 points and went on to beat a tough team that simply never quits. 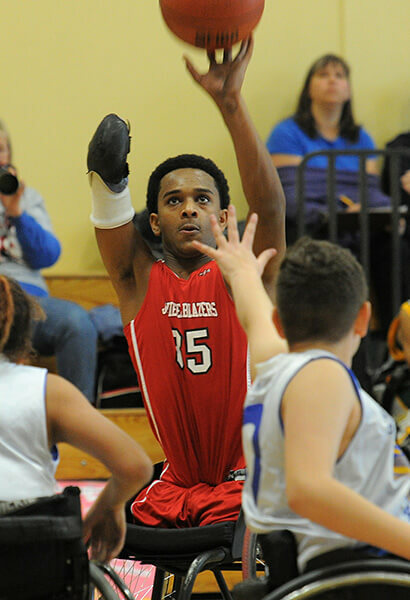 Koda led the Jr. Road Warriors with 16 points. William was everywhere and added 14 points and 4 assists, and Amit added the final four points and Andre contributed four assists to the effort. This was another incredible TEAM win. Everyone contributed. Christie, Cortney, Griffen, Daniel, and Matthew all came in and did their jobs incredibly well. Even when Griffen got a foul called on him late in the game, it was because he was hustling to make a pick for his teammate. Daniel’s speed is deceptive and catches everyone off guard. Throughout the weekend there were several times where he had double picks on the same possession. Matthew continues to work great with Koda to get him his shots, and Andre and William continue to get better and play with more confidence, and Amit is growing up on the court right in front of our eyes. BORP parents continue to raise the bar at every event, and this weekend was no exception. Thanks to all the parents and families for making this weekend such a success. This entire event would not have happened if not for the efforts of the families involved. Na’ama (Christie’s mom) and her army of BORP parents and volunteers including: Kelly (Cortney’s mom), David & Jenny (William’s parents), David H. (Matthew’s dad), Sylvia (Daniel’s mom), Aric (Koda’s dad) – YOU ARE INCREDIBLE!! It is amazing how willing you all are to do for others. Throughout the weekend they served hundreds of meals, kept a hospitality room supplied for athletes, staff, support people, and referees, kept score, ran the clocks, ran water for teams, made trips to the stores and gave up watching the 49ers game for the tournament. Nancy & John – Thank you for providing food on Friday and for your continued support for our programs. Steve Harwood, Bill Cosden and crew – THANK YOU!! You brought each game to life and added so much to the tournament. 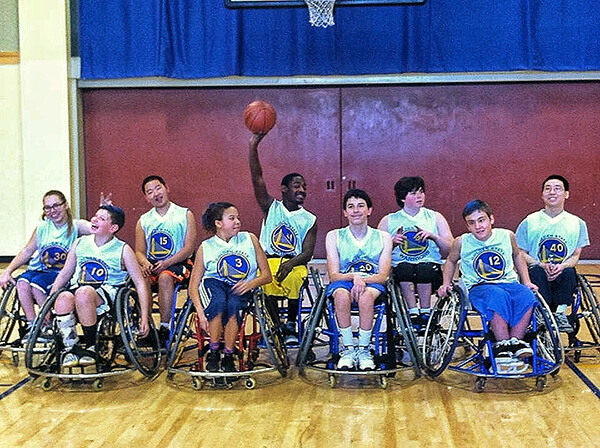 The Golden State Warriors – Thank you! And, of course, thanks to Scot Goodman for the great photos! Thanks to all the families that came to the games, all the folks that made posters, and everyone else that had a hand in making the tournament such a success. The BORP Bombers and Crushers hosted the Kryptonite Pride (Hayward), Santa Barbara Rollin’ Rebels and the San Luis Obispo Dragons on January 11 for their first home games of the 2014 season. The James Kenney gym was full all day and the fans were treated to some thrilling games from all 5 teams. Mojo acquisition was confirmed in the Bombers 2nd game as they staged a nail-biter with the SLO Dragons. Dindzans continued her goal scoring ways as she knocked in 2 in the first half with one ably assisted by Stephen Dykstra. The first half ended 2-2 as Dragon D’Arcy Mumaw matched Dindzan’s output with 2 goals of her own setting up a nerve-wracking second half. Both teams came out of the break with defense on their minds. Inspired goalie play at each end kept the second half scoreless until the 35th minute when Dykstra drove home the Bombers’ 3rd goal. Despite only having 5 minutes left in the game the Dragons kept their composure and with 1 minute left got a third goal from Mumaw securing a 3-3 tie that felt like a well earned result for both these scrappy teams. The Crushers dominated in both their games with an 8-0 win over the Rebels and and a 13-0 victory over the Dragons. The Crushers aggressive team play kept their opponents bottled up in their own end and the Crusher goalies were rarely threatened. Every Crusher contributed to the scoring bonanza and many of the scoring opportunities were the results of systematic build-up that has been the focus in practice. There was one own goal. Thank you to all the fans for rocking the gym with enthusiastic support for all the teams! Thanks to the AMAZING Boosters who once again provided a delicious banquet of lunch and snacks! Thanks to Stephanie, Chris, Adonis, Eddie, Rose, Tyree and all the James Kenney staff for their warm support of our programs. Thanks to BORP and the volunteers and referees and athletes, families, staff and friends of all the teams that helped make this a wonderful day of soccer! Attached photo of group courtesy of Scot Goodman. Scot Goodman Gallery on the way. The 2014 Northern California Regional Jr. 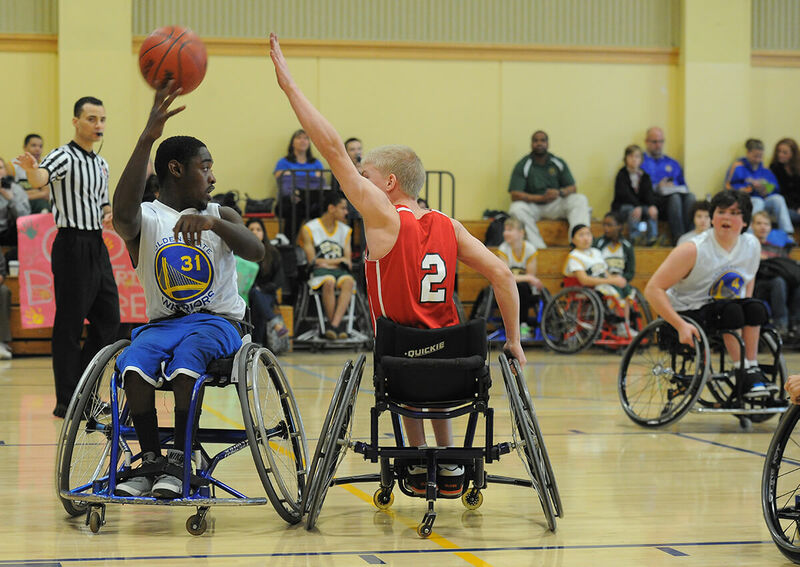 Wheelchair Basketball Tournament is this weekend, January 11 & 12 at the Longfellow Middle School (1500 Derby St.) in Berkeley. BORP’s varsity team will be playing for the first time as the Jr. Road Warriors after a partnership with the Golden State Warriors was formalized late last year. Admission for all the games is FREE. Download the flyer below, or find the tournament schedule beneath the flyer. Go BORP! 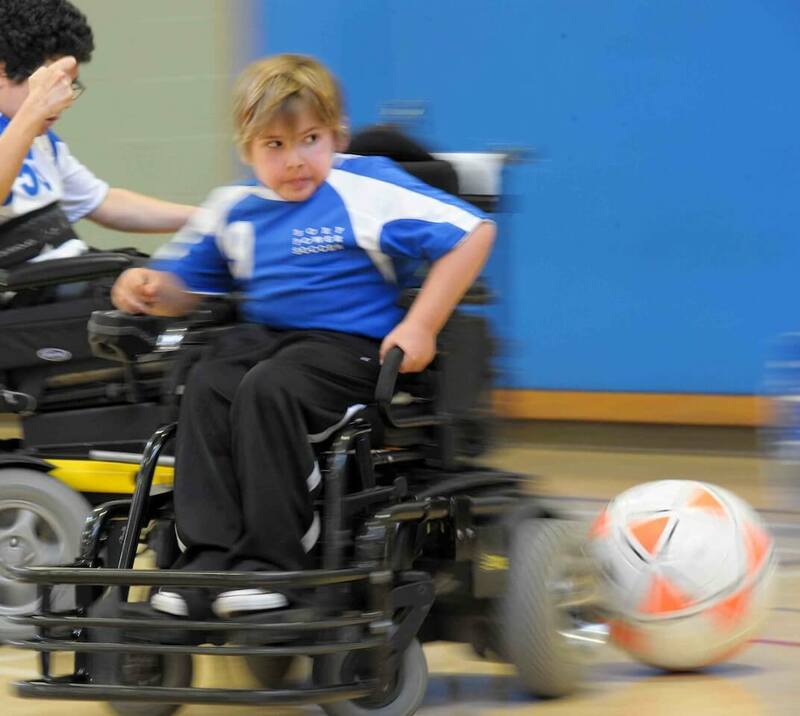 BORP will host a full day of power soccer games on January 11, 2014 at our home court, James Kenney Recreation Center, 1720 8th Street in Berkeley. Please come out and support the BORP Bombers and BORP Crushers as they mix it up with teams from Hayward, Santa Barbara and San Luis Obispo. Admission is FREE.